Glycine is a dietary amino acid that also acts as a neurotransmitter, influencing both excitatory and inhibitory neural signaling in your brain. Glycine reduces sleep latency or the time it takes to fall asleep, improves the quality of sleep, and increases the feeling of being well-rested after a night of sleep. The improved sleep that is achieved with glycine supplementation can increase cognitive performance. Glycine is a dietary amino acid that functions both as a building block of protein structures and in neurotransmission, as glycine itself can directly bind to receptors on neurons, regulating the function of these cells. The enzyme serine trans hydroxy-methylase (SHMT) converts the amino acid serine into glycine in neurons. (Figure 1). 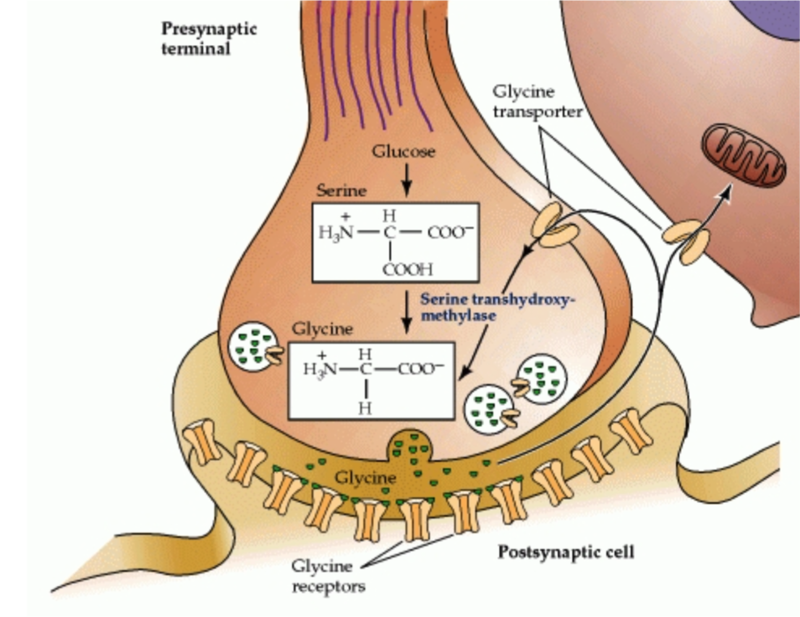 Glycine is unique as a neurotransmitter since it functions in excitatory as well as inhibitory neural signaling, whereas most neurotransmitters tend to be excitatory or inhibitory but not both. Glycine binds to glycine receptors for inhibitory neurotransmission. Glycine subjectively improved sleep quality by improving subjective measures such as "fatigue," "liveliness and peppiness" and "clear-headedness," as measured by the St. Mary's Hospital Sleep Questionnaire and Space-Aeromedicine Fatigue Checklist, according to a follow-up study4. Glycine reduced psychomotor fatigue and improved reaction time in a psychomotor vigilance task in a 2012 study. Glycine can be consumed at bedtime, in combination with other sleep-promoting nootropics, to enhance sleep. The majority of individuals do not experience significant side effects when taking glycine orally, but there have been a few reports of nausea, vomiting, stomach upset, and drowsiness. There is not enough known about glycine supplementation during pregnancy and breastfeeding. Glycine is approved as a dietary supplement component under provisions of the Dietary Supplement Health and Education Act of 1994. It is classified as generally recognized as safe (GRAS). Bannai, M., & Kawai, N. (2012). New therapeutic strategy for amino acid medicine: glycine improves the quality of sleep. J Pharmacol Sci, 118(2), 145-148.